(J No. 6) Preliminary Survey of Point Reyes and Drake's Bay California. 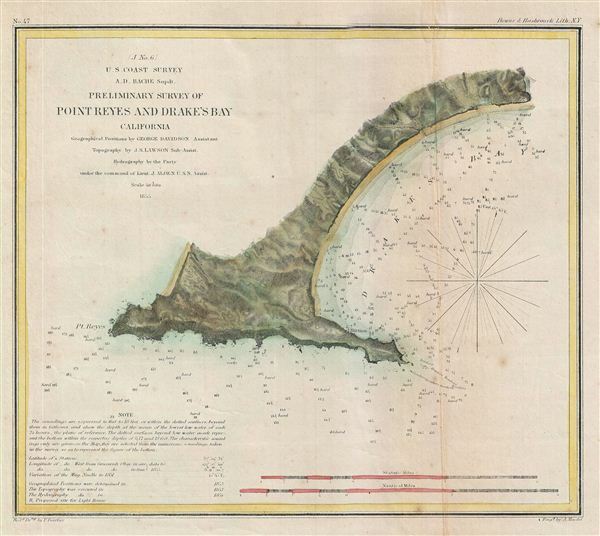 An uncommon 1855 map of Drakes Bay or Puerto de Los Reyes, California. Located approximately 30 miles northwest of San Francisco, Drakes Bay has long been considered the most likely landing site of the englishman Sir Francis Drake on his historic 1579 circumnavigation of the world. The map features numerous depth soundings and excellent inland topographical detail. A note in the lower left quadrant discusses the soundings. Drawn on a scale of 1:40,000. The Geographical positioning for this chart was the work of George Davidson. The Topography was accomplished by J. S. Lawson. The hydrography was completed by a party under the command of J. Alden. The whole was compiled under the exacting direction of A. D. Bache, Superintendent of the Coast Survey. Report of the Superintendent of the United States Coast Survey, Washington, 1855. Good condition. Some toning and verso repair and reinforcement on original fold lines. Some foxing throughout - see image. Blank on verso.